We are always accepting new clients into the Marion Animal Hospital family, and we look forward to learning more about you and your wonderful pets. It is our mission to provide the best veterinary care possible for our patients within your wishes and means. We pledge to serve our local community as a pet and animal information resource, and we solemnly swear to uphold out veterinary oath on a daily basis. If you are new to our practice you can complete our New Client form either in person, online through our website, or by printing out the PDF form below. 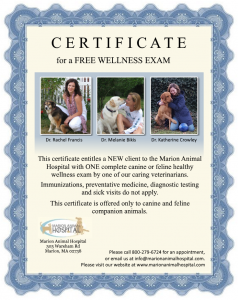 As part of our effort to welcome you to our practice we also offer one free canine or feline health exam to new clients. The certificate for this exam can be printed out and presented to our team during your first visit, or you can present it to us on your mobile device.